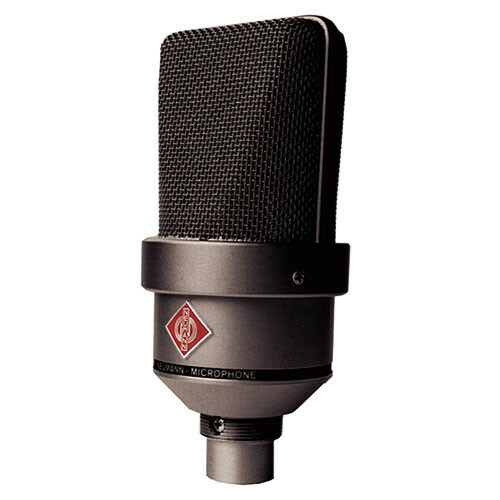 The black TLM 103 D Large-Diaphragm Condenser Microphone from Neumann is a digital, cardioid, directional microphone that features low self-noise and high sound pressure level transmission. The capsule, derived from that used in the Neumann U 87, has a cardioid pattern, is acoustically well-balanced, and provides great attenuation of signals from the rear. The TLM 103 D is equipped with a large-diaphragm capsule with a cardioid pattern. By focusing on this pattern, the attenuation of unwanted rear sound has been optimized. Off-axis sounds are rendered naturally while isolation is increased. This also leads to a high feedback suppression when the microphone is used in live situations or where loudspeaker playback is a factor. The TLM 103 D is addressed from the front. The K 103 large diaphragm capsule is based on the K 87, and has a flat frequency response up to about 5 kHz, and above that, a wide flat 4 dB presence boost. The large, wire mesh head-grille protects the capsule from plosive sounds and effectively prevents pop noises. These characteristics are achieved without resorting to corrective resonance effects. The microphone maintains a great impulse response and reproduces details of music and speech without coloration. With just 7 dB-A and 17.5 dB CCIR, the self-noise level of the TLM 103 D is so reduced that even the smallest signals are reproduced almost noise-free. It is capable of handling sound pressure levels up to 134 dB without distortion. With TLM technology, the usual output transformer is replaced by an electronic circuit. As with traditional transformers, it ensures good common mode rejection, and prevents RF interference that may influence the balanced audio signal. The entire internal construction is elastically mounted to attenuate any structure-born noise that could interfere with the TLM 103 D's operation. The capsule is set on an elastic mount and the frequency range reaches below 20 Hz, allowing even very low bass signals to be reproduced without coloration. Due to this low-frequency extension, the TLM 103 D is more sensitive to structure borne interference and wind noise. This digital microphone is for use with Neumann AES/EBU, AES 42, or S/PDIF. The signal is converted directly at the capsule. Box Dimensions (LxWxH) 10.1 x 4.8 x 4.0"